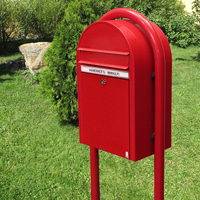 Bobi offers letterboxes for walls and free standing post boxes. 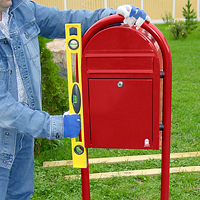 All letterboxes are easily installed and they can be mounted to a wall, fence or into the ground. 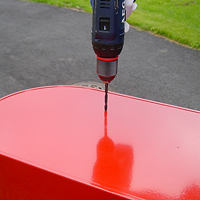 The installation guidelines below contain detailed instructions for installing Bobi wall mounted post boxes and for mounting a single free standing post box into the ground with a matching letterbox stand. Should you require any additional information about the installation of your letterbox, please contact our customer service team. 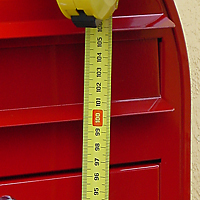 Please note that according to the European standard for letter boxes, EN 13724:2002, a mounted height of between 0.7 and 1.7 meter for the aperture is recommended. 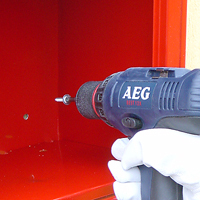 remove all metal remnants from the inside of the letterbox. 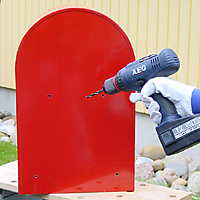 small metal parts are removed from the holes, seams and bottom of the letterbox. 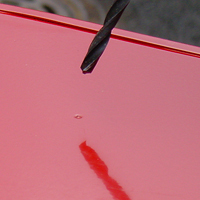 Any metal remnants can, over time, lead to rust on the inside of your letterbox. letterbox this can cause unsightly marks. Please check the height of the letterbox. We advise to have the aperture of the letterbox at approximately 1 meter from the ground. 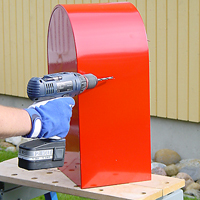 Use a screwdriver to fasten the parts together and tighten the screws from inside the letterbox. Please ensure there are no gaps between the wall or fence and the letterbox. The result is a sturdy wall mounted post box. All our letter boxes can be installed as single freestanding letter boxes with the Bobi Round stand or the Bobi Link system. The Link system offers you the possibility of attaching 1 or more Bobi letterboxes together. The Bobi Round stand must be installed over the letterbox. 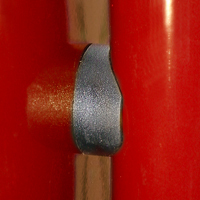 The legs ("links") of the Bobi Link must be attached to the sides of the letterbox. All fittings (4 plastic washers and 4 screws) are included. It is essential that you install the letterbox as firmly as possible. We recommend using quick set concrete. This is NOT included and will have to be purchased separately. the sides of the letterbox. 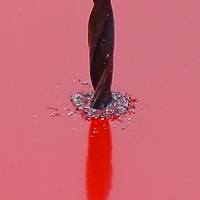 Using the 6mm drill bit made from hardened steel to drill out these 4 holes. it's back (preferably on something soft to avoid any damage). 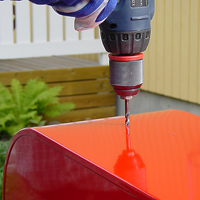 Use the screwdriver to fasten the parts together and tighten the screws from inside the letterbox. Dig a hole approx. 40x40 cm. Stand the letterbox in the hole and check the level. 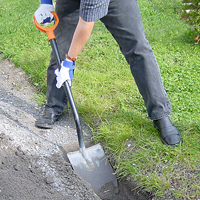 Fill the hole with coarse gravel or concrete. If you are using concrete, please make sure it hardens properly. letterboxes. Write down and save the key code. 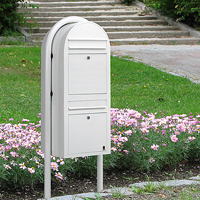 The Bobi Link stand is the ideal solution for attaching multiple free standing letter boxes. For installation please see the description above for installing the Single mounted letterbox. When installing the Bobi Link, please ensure you order 1 link more than you have letterboxes. 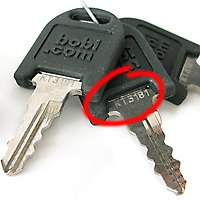 For the installation of 2 letterboxes, you will need 3 Bobi Links. 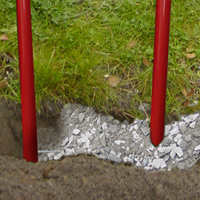 All Bobi freestanding post boxes can be installed on a hard surface (stone, concrete or asphalt). For this you will have to purchase special stainless steel flanges, which can be used with the Bobi Round and Bobi Link. 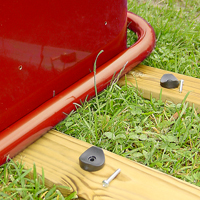 The flanges can be secured to the ground with screws. Please note: to ensure a safe and correct installation the stand will need to be shortened. We will be happy to do this for you before despatch. In deliberation with you we will saw off the required amount of centimeters. If you would like to know more about this option, please contact our customer services.